Feichtinger KG is a private company from Esternberg (Upper Austria) and provides approximately 30,000t of quartz a year to the RW silicium GmbH. The company has been active in the mining of quartz since 1972 and currently employs 18 staff. In addition to this, Feichtinger KG is also involved in riding arena construction (www reitplatzbau.at). Due to increasing customer demands it became necessary to sort out impurities (the green and red stones) in high quality quartz. Consequently, Feichtinger KG issued a tender request in 2012 for the elimination of these contaminants through a sensor-based sorting machine. This resulted in several successful sorting trails being conducted by BT-Wolfgang Binder in collaboration with the customer. A visit was also made to the Leube company in Golling, which has already been using REDWAVE mineral sorting machines for two years. lt was also possible to successfully implement the customer requirement to install the sorting machine directly onto the existing screening machine and thus have minimal influence on the operation. This facilitated the minimisation of additional costs as well as savings in space. The mineral sorting machine has been in successful operation separating impurities from quartz since June 2013. These contaminants can be readily identified and sorted with the REDWAVE 1300 S (mineral sorting machine). The installation of the machine and the adaptation of the existing plant were carried out by the client. 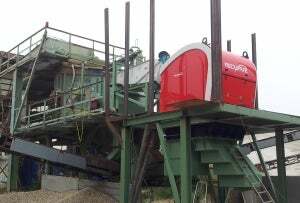 The owners of Feichtinger KG, Joachim and Fritz Feichtinger, commented: "We have been very impressed with the REDWAVE technology and the existing established system at Leube, and we are very pleased with the sorting equipment."